On Christmas Day in 1864, one of America's best known poets, Henry Wadsworth Longfellow, wrote a poem he titled, "Christmas Bells." That poem would later be set to music and become known as, "I Heard The Bells On Christmas Day." Why would Longfellow write about 'Peace on earth, good will toward men' while the American Civil War is in progress? There certainly wasn't peace during that time. As a matter of fact, when Longfellow wrote his poem it would be months later before Lee would surrender to Grant. But, did you know that some of the verses in the poem were omitted for the song to shorten it, and that it is in those verses that Longfellow speaks about the war? While the song is about the war, it is more about hardships Longfellow had to endure in the days and years leading up to the poem. Three years earlier, on July 9, 1861, his wife of 21 years, Frances, or Fanny, Appleton, wrote in her journal, "We are all sighing for the good sea breeze instead of this stifling land, one filled with dust. Poor Allegra is very droopy with heat, and Edie has to get her hair in a net to free her neck from the weight." The next day, after trimming some of seven year old Edith's beautiful curls, Fanny decided to preserve the clippings in sealing wax. Melting a bar of sealing wax with a candle, a few drops fell unnoticed upon her dress. The longed for sea breeze gusted through the window, igniting the light material of Fanny's dress and immediately wrapping her in flames. In her attempt to protect Edith and Allegra, she ran to Henry's study in the next room, where he frantically attempted to extinguish the flames with a nearby, but undersized, throw rug. Failing to stop the fire with the rug, he tried to smother the flames by throwing his arms around Frances, severely burning his face, arms, and hands. Fanny Longfellow died the next morning. The first Christmas after Fanny's death, Longfellow wrote, "How inexpressibly sad are all holidays." A year after the incident, he wrote, "I can make no record of these days. Better leave them wrapped in silence. Perhaps someday God will give me peace." Longfellow's journal entry for December 25, 1862 reads: "A merry Christmas' say the children, but that is no more for me." To add to his sorrow, almost a year later, Longfellow's son, Charles, was severly wounded in a civil war skirmish with a bullet passing under his shoulder blades and taking off one of the spinal processes. There was no entry in Longfellow's journal during Christmas of 1863. And then, on Christmas Day 1864, he wrote "Christmas Bells." What an incredible story! I admit there have been times in my life when I wanted to skip Christmas. I understand why Longfellow did not write in his journal during the Christmas of 1863. 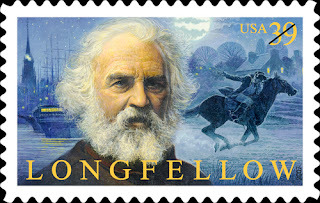 Even though it is about the birth of Jesus, Christmas can also be a sad time for people suffering like Longfellow did. His story is evidence that God hears us when we cry, and that He can wipe away our tears. Most of the words in Christmas Bells fits the world we live in today. In the third verse, Longfellow writes 'the world revolved from night to day.' It was his way of saying he had finally found the peace he had been longing for. Where are we in 2010, night or day? I think we all know the answer to that. Just as Henry Wadsworth Longfellow found peace, so can I...and so can you. Longfellow assured us we can when he wrote, "God is not dead; nor doth he sleep. The Wrong shall fail, the Right prevail with peace on earth, good will to men." Merry Christmas everyone! "O give thanks unto the Lord; for He is good; for His mercy endureth for ever."